Endodontics means "inside the tooth". 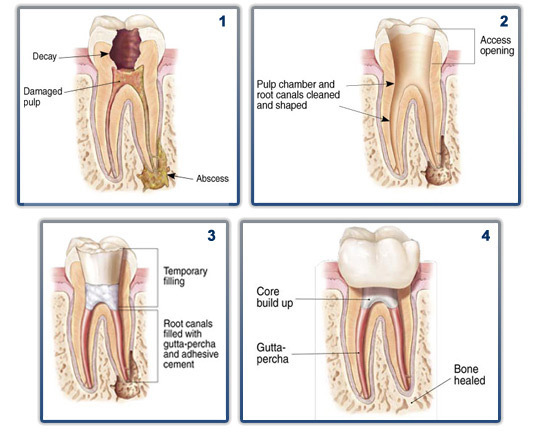 Endodontic treatment (root canal) treats the inside of the tooth by removing infected and diseased tissue. The outer layer of the tooth is the white enamel and this layer covers another layer of hard tissue called the dentin. Inside the dentin is the dental pulp. The pulp contains blood vessels, nerves, & connective tissue and is responsible for the formation of the surrounding hard tissues of the tooth during development. The pulp is housed inside the tooth much like pencil lead is housed inside of a pencil. Endodontic treatment is necessary when the pulp becomes inflamed or infected. The inflammation or infection can have a variety of causes: deep decay, repeated dental procedures on the tooth or a crack or chip in the tooth. In addition, trauma to a tooth may cause pulp damage even if the tooth has no obvious visible signs of damage such as cracks or chips. 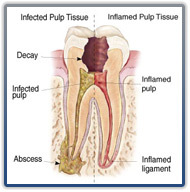 If pulp inflammation or infection is left untreated, it can cause pain and/or lead to an abscess. Signs of pulp damage include pain, prolonged sensitivity to heat or cold, discoloration of the tooth and swelling and tenderness in the nearby gums. Sometimes, there are no symptoms. Your dentist may diagnose the presence of infection before symptoms have developed. The endodontist removes the inflamed or infected pulp, cleans and shapes the inside of the tooth, and then fills and seals the space. 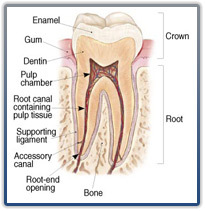 Usually a crown is needed to protect the tooth and restore it to full function. The tooth continues to function like any other tooth, because the tooth continues to be nourished by the tissues surrounding it. What can I expect during and after Root Canal Treatment? Most cases take less than an hour. Current advances in techniques and anesthetics make treatment very comfortable during the procedure. Intravenous Sedation is available in our office for those patients who desire to be sedated. Patients who choose Intravenous Sedation report an excellent dental experience and do not remember the procedure. * Most patients can return to work and daily activities immediately after treatment much like they would after a dental filling. For the first few days after treatment your tooth may feel sensitive, especially if there was pain or acute infection before the procedure. This discomfort can be relieved with over-the-counter or prescription medications. Follow Dr. Saltzman's instructions carefully. *Please see Sedation for more details about Intravenous Sedation. Do I need to take antibiotics before the Root Canal? No. The sooner the infection is removed, the sooner you will feel better. Removal of infection from your body is the most important step to relieving pain and swelling and allows antibiotics to work more effectively. Current advances in endodontics and anesthetics make this possible. Why suffer with a toothache and/or swelling for a week when relief is available now! Endodontic treatment and restoration of the natural tooth are less expensive than the removal of the tooth and an artificial replacement. Actually, the value of a natural tooth is irreplaceable. Most dental insurances policies provide coverage for endodontic treatment.